As kids begin to learn their numbers and count and understand cardinality (the number of items in a set), they will then be able to compare things. This becomes evident early on if you have more than one child, because they are quick to notice if brother or sister “has more than me!” While serving as referee in those sibling squabbles over more or less is not fun, this is an important math concept to master! And it starts with hands-on visuals which allow kids to see that one pile is bigger or smaller than the other. 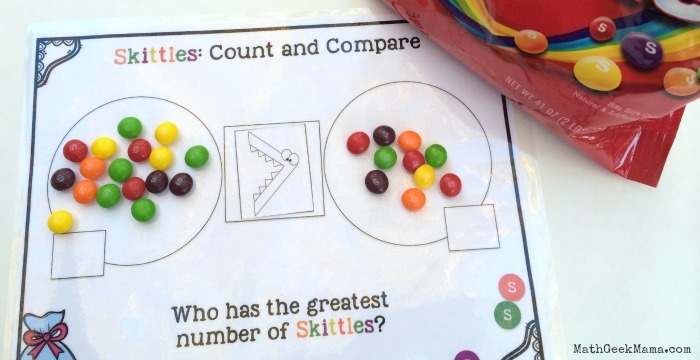 This Skittles Count and Compare math lesson is a fun (and tasty!) way to let kids practice comparing groups of numbers and can be adapted depending on the age of your kids! There are multiple printable mats included in this download, so you can use this as a quiet independent activity, or as a partner activity. 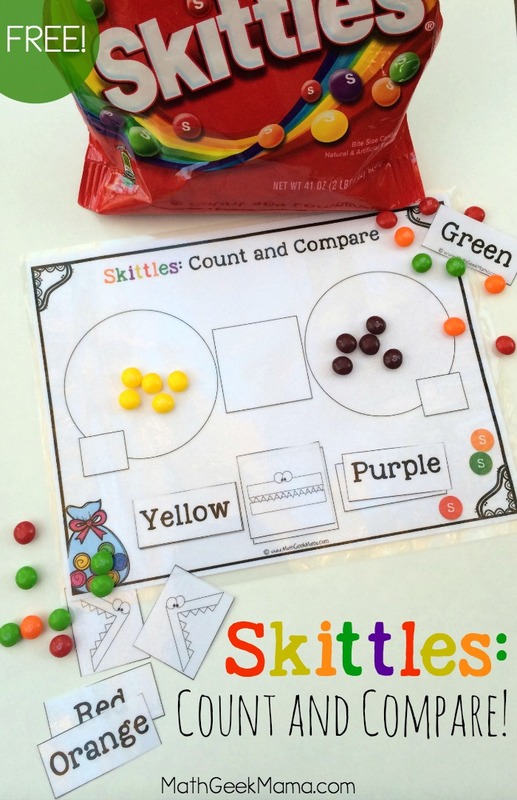 One of the mats in this lesson pack simply offers two circles for different colors of Skittles , as well as cut out color words and “greater than” “less than” and “equal to” signs. This is a fun way for young kids to work on learning color words as well as being introduced to these math symbols. 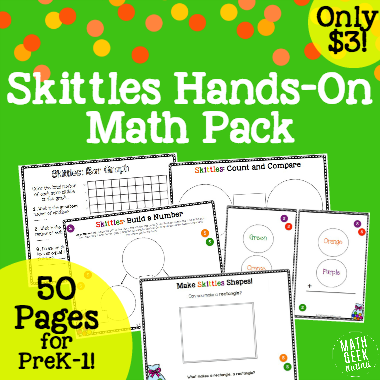 To use, simply give each child a handful of Skittles and let them play with the mat, comparing different colors to each other. They can then use the cut out pieces to make a number sentence at the bottom of the mat. Another independent activity that you can use with older kids has questions at the bottom for them to compare and write in the correct symbol. I laminated all of the mats so that we can write on them and then erase to use again. 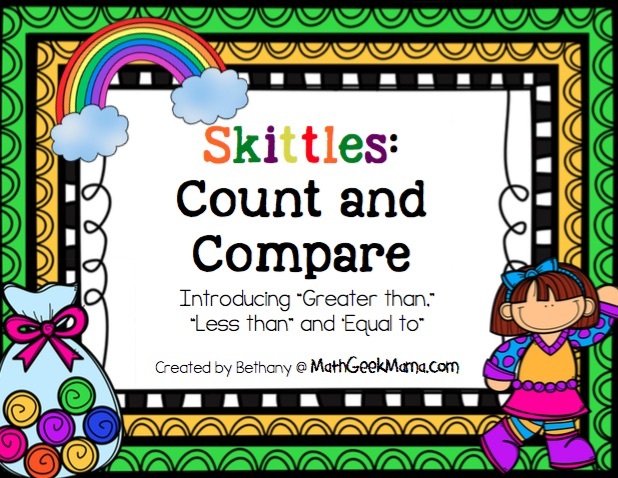 A third mat in this printable pack simply has the two circles to compare Skittles counts and asks “Who has the greatest number of Skittles?” This would be a fun way for kids to pair up and see who can grab the largest handful (using gloves if you’re a classroom teacher, or simply pour a handful for each student). 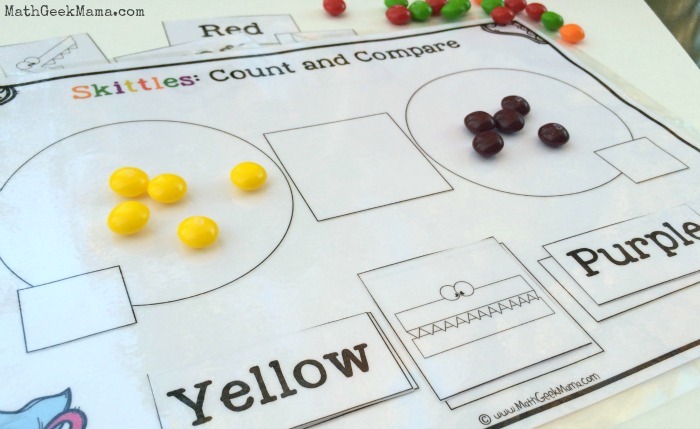 Students can then compare their handful, as well as compare the different colors. Who has the most red? The most yellow? etc. This printable pack also includes black and white versions of each of the “count and compare” mats if you are looking to save ink! This is so cool! My girls will love it. Wish we had Maths games like this when I was a kid – great way to make learning fun! Thanks Sarah! 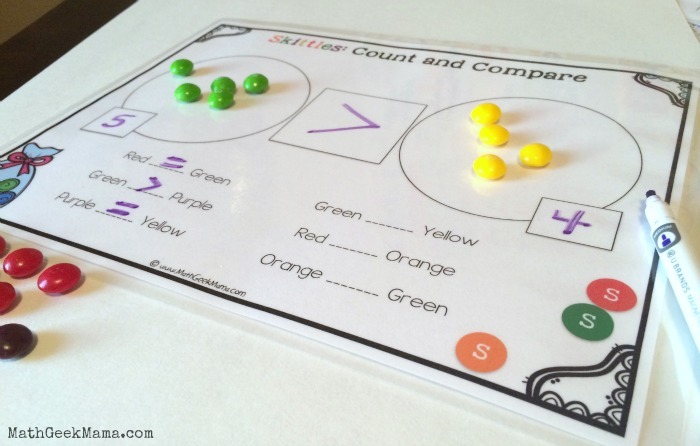 My kids certainly love it when we get to do “Skittle Math” haha! Hi! I just added the free printables to my cart and filled out my information..is there a way to print them from my computer?